Oil Worker Death Uncovers Risk In Bureau Of Land Management Rules : Shots - Health News Oil worker Dustin Bergsing, 21, was found dead on top of a North Dakota oil tank in 2012. A journalist and a doctor looking into the death found a pattern of similar fatal accidents. 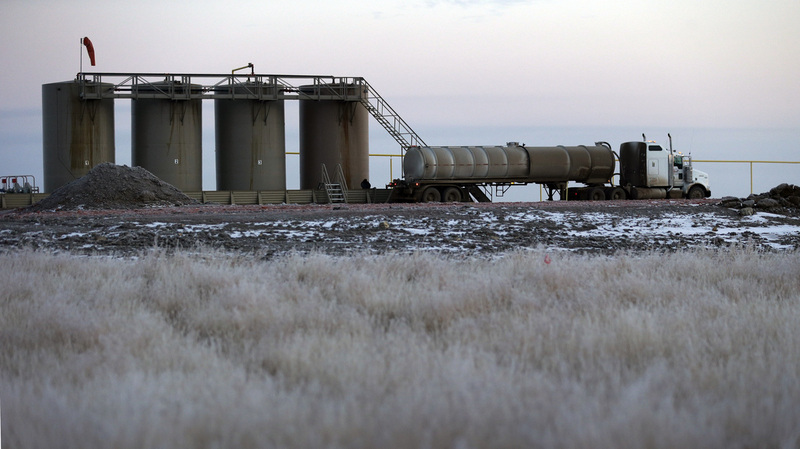 An oil field truck is used to make a transfer at oil-storage tanks in Williston, N.D., in 2014. It was atop tanks like these that oil worker Dustin Bergsing, 21, was found dead.